As the warmth of the season beckons us outdoors, many pet and plant lovers are caught in the crossroads -- is it possible to intertwine a love for nature while meeting the needs of our beloved domestics? The short answer is yes -- with a little bit of ingenuity! 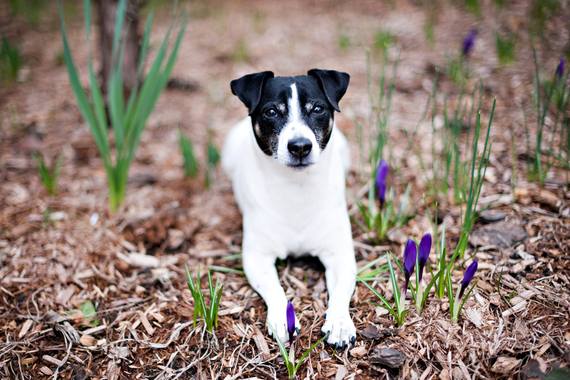 Here are spring's top tips for gardening pet lovers. 1) Pet owners should choose fertilizers and mulches cautiously. Shop for organic, pet-friendly fertilizers and soil amendments. Be aware that many environmentally friendly fertilizers contain fish byproducts, blood meal and ground poultry feathers. These ingredients are very appealing to many dogs and may cause digestive upset if eaten in quantity. If possible, keep your pets away from newly fertilized beds and lawns until the product has dissolved. Alternatively, consider liquid fertilizers. When buying mulch, avoid cocoa mulch. It is toxic to pets and lethal if ingested in quantity. Choose root mulch, wood bark or gravel instead. My favorite? Pine bark mulch, in any form. 2) If you have a dog, consider his essential "dogness" -- dogs like to course the perimeters of their territory, aka your yard. If your plantings run up to the edges of your property, they're likely to get trampled. To prevent this frustration, keep or create an 18- to 36-inch pathway around the boundary of your property, especially if you plan to erect fencing. 3) Speaking of fencing, many dogs get quite frustrated when they can't see out of their property to identify noises and passersby, which leads to digging and/or frustration barking. Often, dogs destroy garden beds or bark themselves into frenzy out of frustration and boredom. If your containment system blocks your dog's vision, consider a transparent window erected at eye level (your dog's, that is). I use a PetPeek, which the kids love, too. A little porthole into the world outside and a non-planted path around the perimeter can keep everyone on the same page, landscape-wise. 4) Ever notice that your dog excavates your plantings days after you tucked them into the earth? Though maddening, your dog has paid you a high compliment. Ever mindful of your activities, he's watching each handful of dirt you unearth. If he sees you gardening, he will soon mimic your technique. 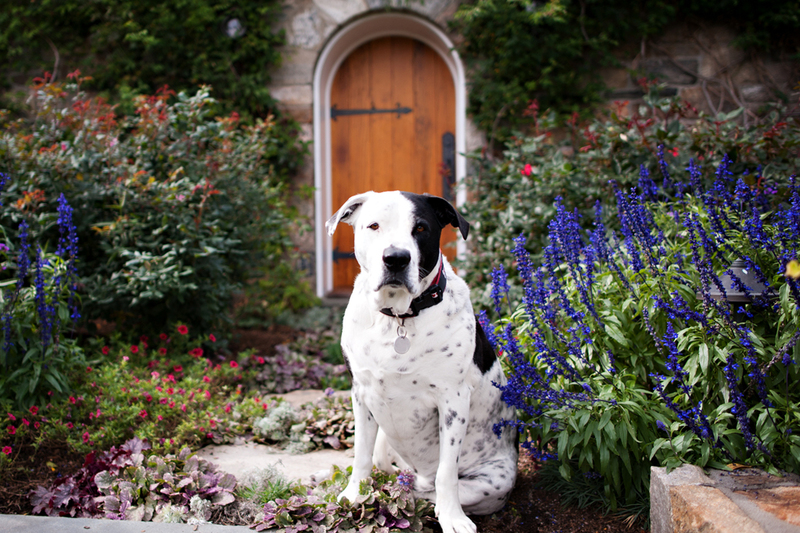 As you begin to shape good canine garden habits, keep your dog inside while you tend your plants. 5) If your dog enjoys digging, he will likely always relish the feeling of the earth on his paws. If this is the case, you'll need to provide a dog-friendly digging pit -- a small area (think sandbox) filled with sand, dirt and/or pine mulch where you encourage him to "Go dig!" Do this during playtime to encourage his enthusiasm. If he stares at the digging pit and gives you the "huh?" face, try burying a bone, toy or treat and, if necessary, get down on your knees and dig with him! It can be a little tricky to keep dogs out of garden beds. Take a few minutes to consider why your dog enters your planting area in the first place. Is he mimicking you? You'll need to be more discrete when planting and pruning. Is it to eliminate or mark? That solution can be fairly simple, though it may take a week or two. Start by giving your dog his own area away from your tomatoes and prized tulips. Center his new elimination area around a physical structure or tree, or erect a decorative stone or even a faux fire hydrant. Take your dog to the new area on leash in the morning or when you take him out after a separation. Wait to offer your hugs and greetings until after he's gone potty, and discourage your dog from going near your beds by calmly redirecting him on a long line should he venture near. My last suggestion is to remember that your dog is as ecstatic about the spring thaw as you are. He is equally excited to get outside, stretch his legs and bask in the sun. As far as pets and plants go, play with your dog first to tire him out, and garden during your dog's nap times. Next article on gardening will cover boundary training -- a creative, non-threatening technique to keep your pet out of the garden once and for all!